Minh Dang of Vietnam set specific goals for himself while participating in the Professional Fellow’s Economic Empowerment Program. 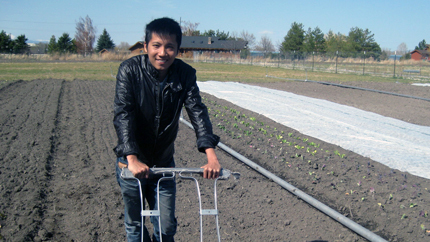 Placed on an organic farm in Montana, Minh wanted to learn as much as he could. During his fellowship, Minh felt right at home with his fellowship host, Laura Garber, and her family. Minh spent every day in his fellowship participating in the family’s activities, waking up and having a farm breakfast of eggs, milk, bread, and coffee, before helping take the kids to school. He and Laura then went to the greenhouse to take care of vegetables and planting. Afternoons were spent learning about the extended network of a farmer: working with partners in Community Supported Agriculture, buyers, colleagues on the Salish and Kootenai Reservation, seed repositories, and other important connections. In the evenings, Minh enjoyed dinners of locally-sourced food and spending time with his host family. Minh has pages of lessons learned to implement upon return to Vietnam, centered on protecting the land and engaging communities. He also learned a great deal from regional colleagues on the program with shared goals in Burma, Thailand, Cambodia, and Laos.